Using the leading-edge technology of the Picasso Dental Laser allows us to provide painless treatment for our patients. 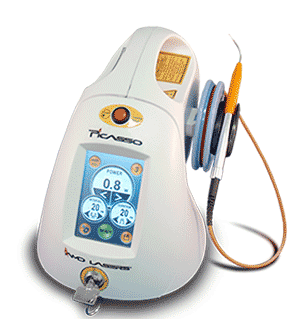 We use the Picasso Dental Laser for pain free procedures. This high technology device generates a beam of concentrated light for exact precision. The new technology is used when soft tissue needs to be removed and offers a reduction in patient discomfort compared to using a scalpel! During a dental laser treatment, a laser device that transmits a highly concentrated beam of light is used to treat tooth decay, enamel, and gum tissue. Common laser dentistry procedures include oral surgery or periodontal treatment. This small soft tissue laser has helped us more efficiently provide painless treatment options for many procedures, such as desensitizing procedures (cankor and cold sores), disinfecting bacteria as adjunct to perio procedures, troughing around crown preparations instead of cord placement, gingivectomies, frenectomies and exposing implants, teeth, and ortho brackets.